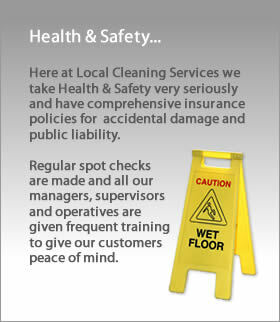 Local Cleaning Services specialises in difficult and high access cleaning. Local Cleaning Services owns two cherry picker platforms. These are used as a solution to all of our awkward access problems. This ensures we have the right equipment to meet your cleaning specifications at all times. Using the Reach & Wash system we can access heights of up to sixty feet without the use of ladders. This system uses water-fed carbon fibre poles leaving a smear-free finish. This minimises Health and Safety concerns and is easily the safest method for fascia and window cleaning.